Several models have explored the possible change mechanisms underlying mindfulness-based interventions from the perspectives of multiple disciplines, including cognitive science, affective neuroscience, clinical psychiatry, and psychology. Together, these models highlight the complexity of the change process underlying these interventions. However, no one model appears to be sufficiently comprehensive in describing the mechanistic details of this change process. In an attempt to address this gap, we propose a psychological model derived from Buddhist contemplative traditions. We use the proposed Buddhist psychological model to describe what occurs during mindfulness practice and identify specific mechanisms through which mindfulness and attention regulation practices may result in symptom reduction as well as improvements in well-being. 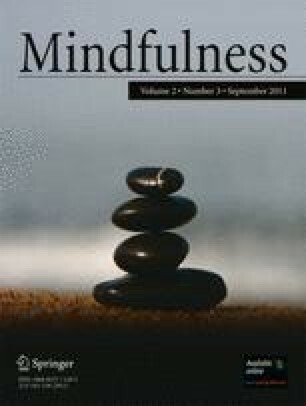 Other explanatory models of mindfulness interventions are summarized and evaluated in the context of this model. We conclude that the comprehensive and detailed nature of the proposed model offers several advantages for understanding how mindfulness-based interventions exert their clinical benefits and that it is amenable to research investigation. The authors would like to thank Steve Armstrong and Susan Woods for reviewing an earlier version of this manuscript and for providing insightful feedback. Mendis, N. K. G. (2006). The Abhidhamma in practice. Retrieved 29 October 2010 from http://www.accesstoinsight.org/lib/authors/mendis/wheel322.html. Mahasi Sayadaw (2006). The progress of insight: A modern treatise on Buddhist Satipathana meditation. Retrieved 16 November 2010 from http://www.dharmaweb.org/index.php/The_Progress_of_Insight_by_Venerable_Mahasi_Sayadaw. Nyanaponika Thera (2010). Seeing things as they are. Access to Insight. Retrieved 16 December from http://www.accesstoinsight.org/lib/authors/nyanaponika/seeingthings.html. Pa Auk Sayadaw (2000). Knowing and seeing. Buddha Dharma Education Association, Inc. Retrieved 16 November 2010 from www.buddhanet.net/pdf_file/know-see.pdf. Thanissaro Bhikkhu (1997). The healing power of the precepts. Retrieved 29 October 2010 from http://www.accesstoinsight.org/lib/authors/thanissaro/precepts.html.